Welcome to my Fun & Games page. Here you will find a few interesting things to while away those boring hours between watching your Star Wars movies (Or while you sit in your little office space staring out the window....if you can see one that is)... Download and print some FREE!! 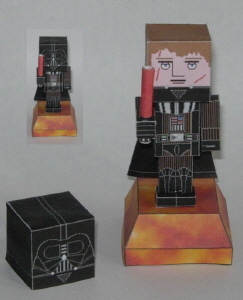 paper models of your favorite Star Wars charracters or print off a FREE!! 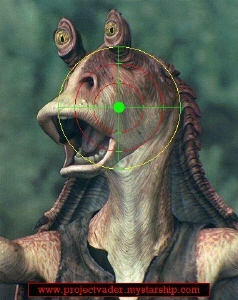 Jar Jar Binks target to shoot at...(If you are in the office, I highly recommend using rubber bands)..with your air pistol or rifle. Why not even play Space Invaders totally FREE!!! here. I will be adding pretty much anything as and when I get the time (Or the inspiration) so please check back regularly. You need adobe acrobat to view and print this file. You can get a free download of adobe acrobat reader from their website. Click Image Below To Play Space Invaders FREE!!!!!! Game opens in new window.